Based near Godalming in Surrey, our team of experienced central heating engineers provide honest, expert advice and a professional service that will ensure we deliver the right solution for you and your home. From repairs and servicing through to the installation of a new central heating system we’re the local company you can trust to deliver a professional service and give you complete peace of mind. Regularly servicing your boiler helps to ensure you get many years trouble-free service and helps to highlight any potential issues that may need addressing. We have many years of experience of servicing boilers in homes across Godalming and the surrounding area. Our annual service involves a comprehensive range of checks and tests to ensure everything is working correctly. As well as servicing boilers, we also provide a full repair service. Our experienced and knowledgeable team are on hand to resolve all types of issues on a wide range of domestic boilers. When installing a new boiler, it’s vital that you choose one that is right for you and your home. With so many options on the market it can seem bewildering, and that’s why you can trust us to discuss these options with you and advise you on the best solution. From initial consultation through to the installation of the boiler, our team will deliver a professional service and complete peace of mind. 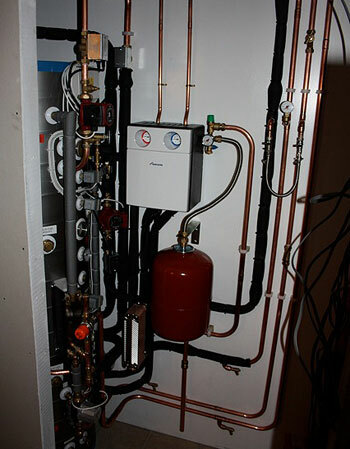 There are a variety of options to consider when installing a central heating system including thermal heat stores, hot water cylinders, and solar systems. We are happy to discuss these options with you to ensure you get the solution that is right for you, your home and your budget.